Beyond Fandom: 'Doctor Who' 706 Review - "The Bells of Saint John"
'Doctor Who' 706 Review - "The Bells of Saint John"
Unless she dies again and we meet Clara number four. But I digress, this version of Clara had quite a bit in common with her other selves. She was a governess in a sense that she was helping a widower friend raise his children,so it makes you wonder if Clara one was a nanny at some point before winding up in a Dalek. Then again this Clara did end up trapped in a machine of sorts. While it wasn’t a Dalek this time, I’d imagine this was actually a more terrifying experience. The whole pulling out people’s souls and immortalizing them in wifi seems to be very similar to “Forest of the Dead” and with this being the 50th anniversary I wouldn’t chalk it up to coincidence. 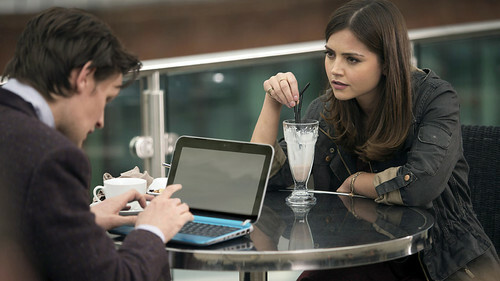 As you can tell it’s pretty clear that Clara will be the central mystery of the current arc. So I wondered about a few things in this episode in regards to whether this Clara remembers things about her apparent former selves or if she is the one that’s originating them. “Run you clever boy and remember” for one, which she uses as a mnemonic device to remember the password to the wifi. 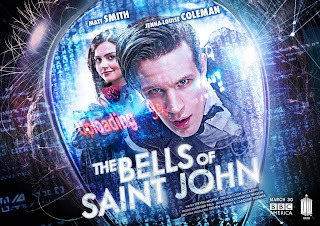 I wonder how many fans are going to use it as their own passwords or usernames now... We also possibly see the origin of the mysterious name Oswin, when she proclaims that, “Clara Oswald for the win, Oswin!” Her return from the data cloud of The Shard’s servers has also made her quite tech savvy which is very similar to Dalek!Clara. From these clues is it possible to assume that this Clara is the same Clara as Dalek!Clara? If so, then where does Christmas Special!Clara fit into it? 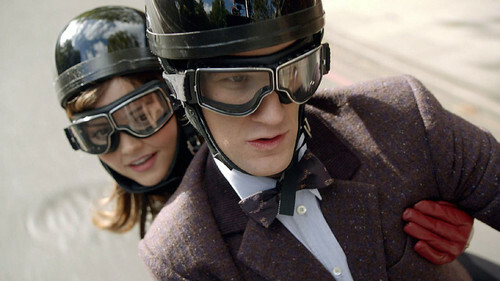 Funnily enough, Clara doesn’t immediately jump on board with joining the Doctor in his traveling “snog box” because she feels an obligation to this family we barely know. Hopefully we’ll get to know them a little better so they become more than just background props for the story,as that is one of the big things I miss from the RTD episodes. I miss seeing how involved the families and friends of the companion(s) were. Former companions Amy and Rory were quite disconnected from everything but the Doctor and so I hope Clara does get her moments back in her proper time just in time for tea. I could talk about Clara for another few paragraphs but an episode of Doctor Who is often only as good as its villains. Our villains of the episode who use creepy tech nicknamed the spoonheads to upload the minds of their chosen victim for their client. A client who happens to be the Great Intelligence. Now, it’s been a little while since Christmas so I checked the Wiki to see if the Doctor might have encountered this enemy before. He has, not only in the latest Christmas special, but in several episodes of the original series. So I imagine this won’t be the last we see of him this season, again pointing to the fact that this is all leading up to the 50th anniversary special. 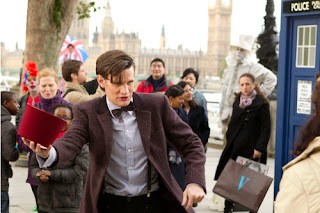 Overall it’s good to have Doctor Who back on the air again, but this episode won’t go down as one of my favorites. It was a lot of fun to watch, but it’s really our base jump into the rest of the season so time will tell how important this episode was overall. Clara and the Doctor have a really great chemistry together, but that’s not really news as we’ve seen it now since the very beginning of season seven. I can’t end without mentioning the Doctor’s new wardrobe. I completely adore it and I can’t wait to see it around more on the show and on cosplaying fans.